So, yes. It’s actually been a week or so since it was officially announced in their website, but I hadn’t really had the time to sit down and announce it here (see? that’s what twitter’s for), so there it goes: Several weeks ago, Jessica Bridger, one of the editors of Berlin-based online magazine Uncube wrote me asking if I’d like to start an ongoing collaboration with them, and -being the internet whore I am-, I immediately said yes. So starting with their issue #07, “Off-Places”, I will start publishing a monthly cartoon in my own section, “Klaus’s Kube”. 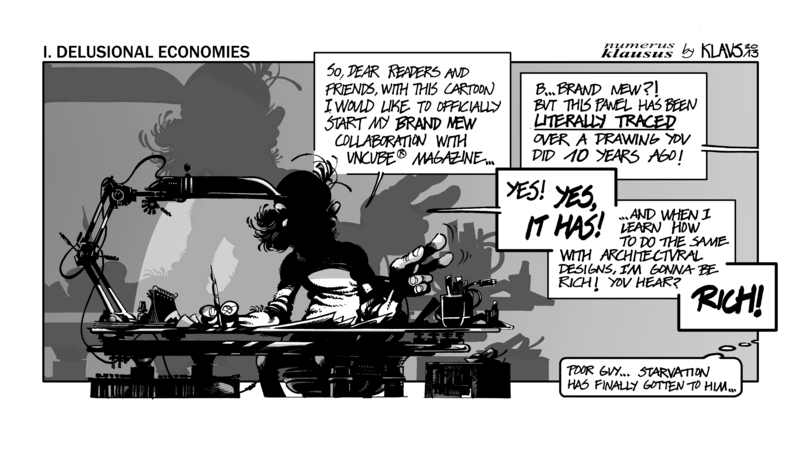 Some of the cartoons will belong in a series, “Numerus Klausus”, commenting on the things that are happening now in the architectural scene, but they will probably be combined with other more otherworldly stuff. Let’s see. Special thanks to Jessica Bridger and Florian Heilmeyer for their interest and support (full team here).